The Photographer and I visited Paris a few years ago. We spent most of our time walking, visiting museums, and eating, but I did a little shopping too. The most famous shopping streets are dominated by global brands that you can find in London and New York and even Washington D.C. But if you move on to narrower streets and deeper into neighborhoods, you will find smaller operations and local craftsmen. In the 4th Arrondissemont we stumbled upon Blancs Manteaux, a shop that I may have conjured up just by wishing: part showroom, part workroom. I was sort of beside myself upon making this discovery: bolts of beautiful fabric — tweed, silk gazar, wool challis — propped up against the walls, a tantalizing peek down a staircase that led to the workroom humming with activity, one little dressing room, and one clerk, who helped adjust the clothes I tried on just so. I wanted it all — all the clothes, the bolts, the clerk — but I limited myself to one jacket, pictured here. 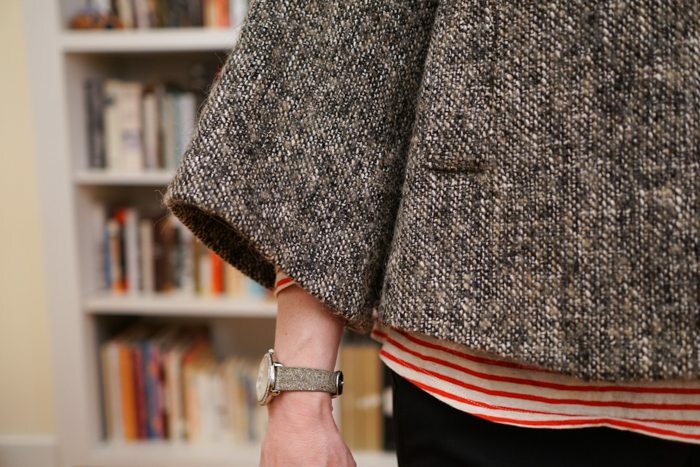 The most charmant jacket, non? 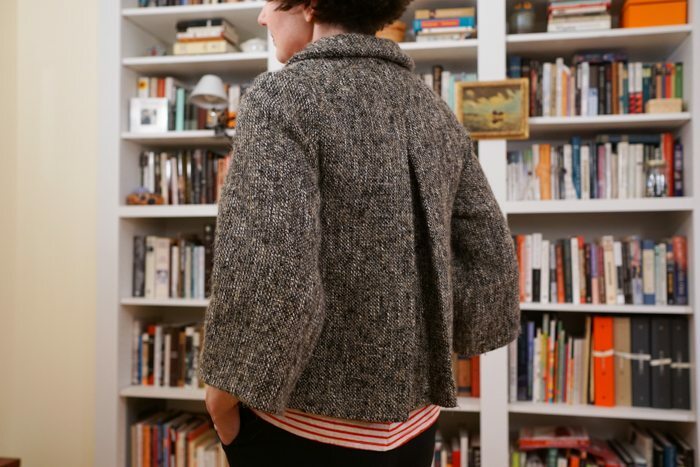 This jacket is made of a heavy tweed lined with a voluptuous satin. In general, I would not use a heavy tweed for a bias cut or swing cut garment, but Blancs Manteaux made it work. The knowing French. 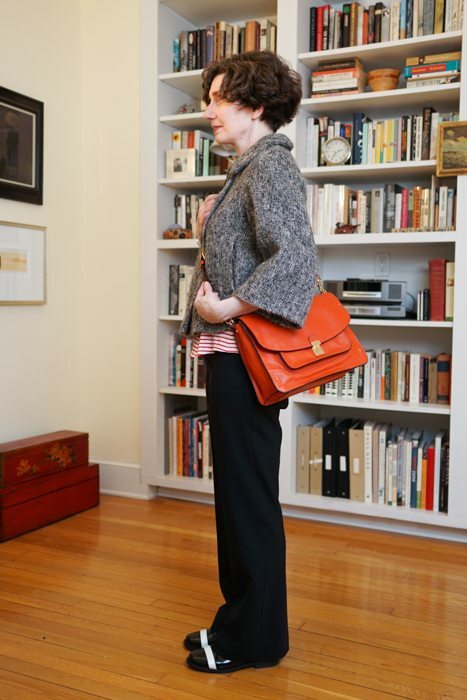 It works, in part, because the jacket is narrow and fitted through the shoulders. 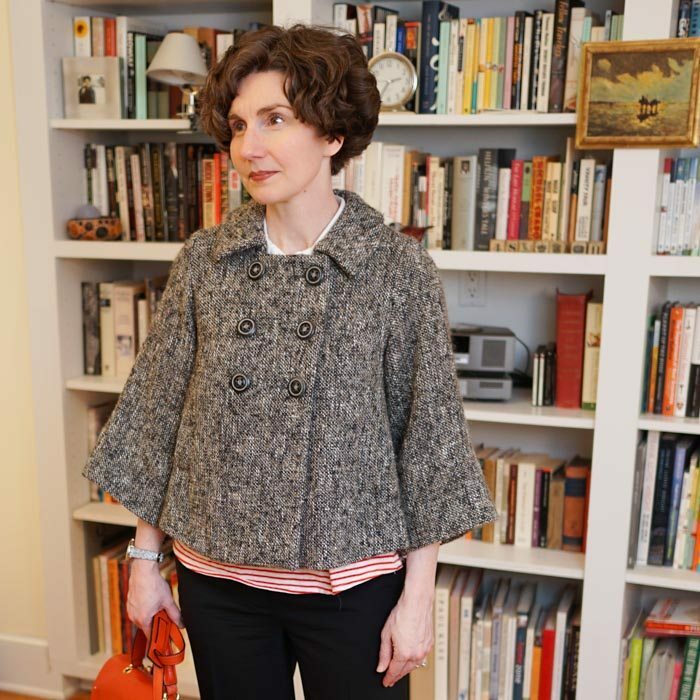 the jacket’s swing is facilitated by an inverted pleat in the back. Sometimes I wear this jacket with a black crewneck sweater underneath, but the orange stripes create a brighter look. Grey pants would work well, too. A side-note: These boots were such a good idea. The white stripe really enlivens the whole ensemble. 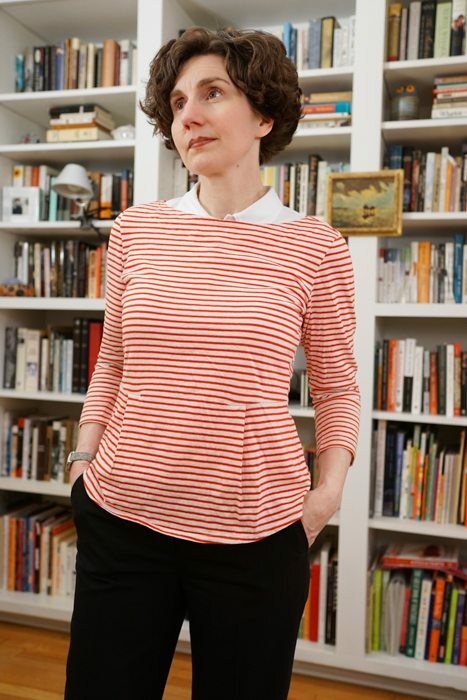 At the risk of seeming a little crazy, I am entrusting you with a secret: I have two of this striped jersey. 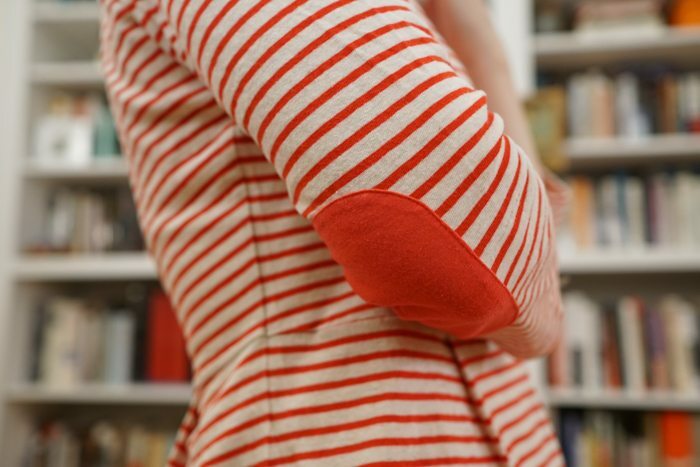 The stripes alone were sufficient to engender a desire for a long-term relationship, but the elbow patches and contoured peplum prompted me to plan for permanence. 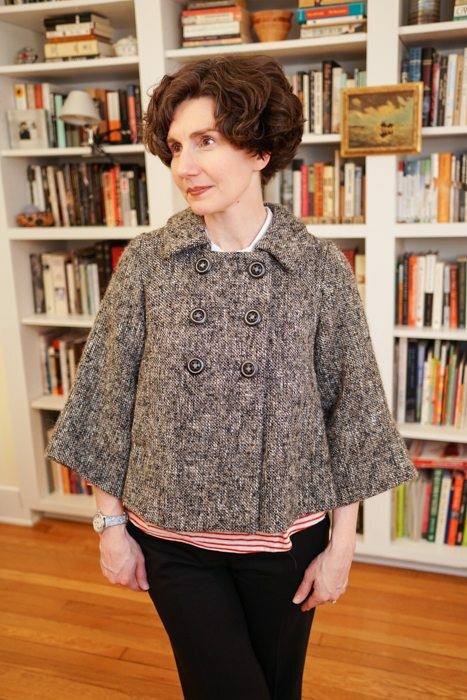 Hello Regina: Layers work best (in my opinion) when the under-layer is snug and the same length as the top layer. When the under-layer is substantially shorter than the top layer, it can get into mischief. The collared jersey is sleeveless. Sleeveless is very helpful for an under-layer. J’adore the jacket and am SHOCKED that we have not seen it before! How has the Directrice managed to hide this little gem from our view? How deep are the Directrice’s closets? I’ve been to her apartment (which you know shares with the photographer) and I can assure you that the closets are few and sadly small. And yet these wonders emerge! 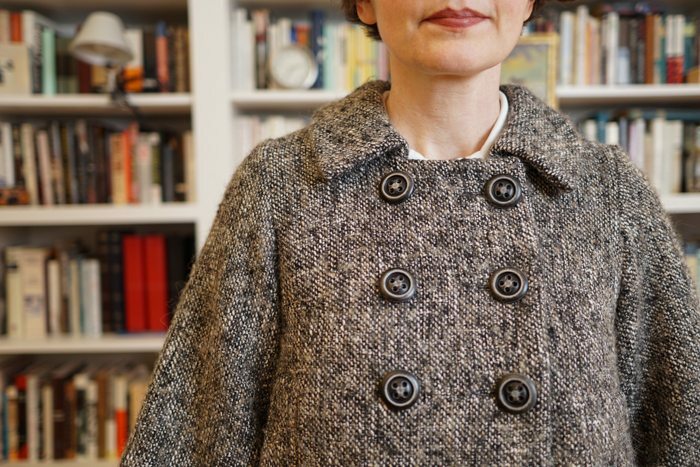 I would love to see this jacket with a black turtleneck and skinny black trouser (or a very narrow skirt) – and perhaps the dark red loafers? The closets can only be explained by reference to Einstein’s Theory of Relativity and the space-time continuum. The infinite wonder! I will try the jacket with skinny pants and the new dark red loafers. Oh how I wish I could have seen that little shop in person…it sounds wonderful! 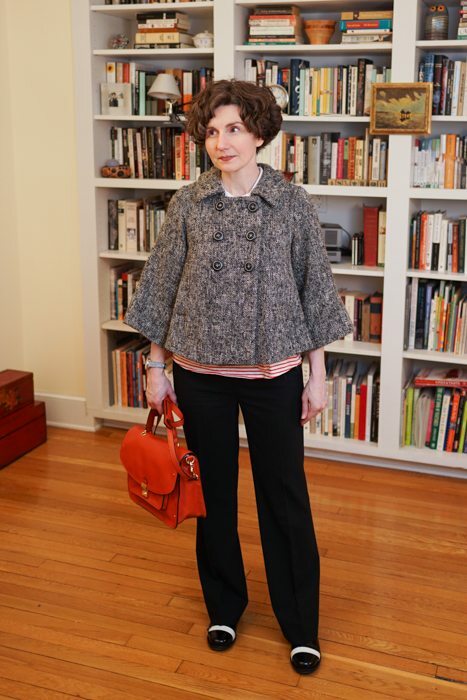 I love the way your swing jacket hangs and as you’ve pointed out so eloquently, the details and proportions are exquisite.